2.1 The blimp you will fly over the quad in this lab. Submitted before 5pm March 30, 2012 on Canvas. One of the many powers of GIS is combining various data based on spatial location. Information can be obtained from aerial imagery or scanned maps, but to correctly overlay other layers of data, spatial reference or a coordinate system must be defined for, and assigned to, the aerial imagery or scanned maps. This is the process of georeferencing: aligning some type of raster imagery to a map coordinate system. This workshop works through two exercises on georeferencing raster imagery, intended to reinforce some of the coordinate system and projection principles we cover in week 2, as an example from which to build good maps from existing data. In the second part of this workshop you will be collecting your own data. You will set ground control with a total station and acquire your own aerial imagery by flying a low-altitude blimp. Aerial imagery can be acquired from satellites, fixed-wing aircraft, helicopters, drones, or tethered blimps and balloons. You will then build some georeferenced, high-resolution imagery of the Quad. Warning: We will be at the mercy of the weather for this lab. Dress accordingly. The two primary objectives of this lab are to 1) teach you how to georeference rasters and 2) reiterate building persuasive and convincing maps. Georeference a digital aerial photo collected from a small blimp using control points. Meets Course Learning Outcomes 2, 4 & 5. The blimp you will fly over the quad in this lab. This week, you are working for USU Facilities Planning and they have given you somewhat vague instructions to provide them with color, georeferenced aerial photography of the entire quad in UTM (metric) coordinates. The quad is bound on the north, east and west by sidewalks and to the south by a road. Therefore the minimum boundaries (i.e. spatial extent of your work) should include these boundaries. Campus Planning would like you to provide clearly labeled figures illustrating the various products you derive and provide notes on the methods used to derived the maps, the relative quality of the georectification, and the resolution of the imagery shown. They are particularly curious whether or not you can provide them with higher resolution photography then the 2006 HROs from the Utah GIS Portal. Learn the process of georeferencing using an example from St. Helena CA, and produce a figure showing a correctly georeferenced historical aerial photo from 1953 side-by-side with a provided 2002 aerial photograph. Use the data you collect in the field to produce a georeferenced aerial image covering the entire quad using the 2006 HRO 1-foot resolution aerial imagery to perform the georectification. Produce a georeferenced aerial image covering the entire quad using the ground control targets you acquired to perform the georectification. Blimp being flown over quad. Total station in foreground to acquire ground control. For Task 1, you are provided with a correctly georeferenced aerial photograph from 2002 (2002_SulphurCreek_AP.tif). For Task 1, you are provided with a non-georeferenced scanned historical aerial photograph of roughly the same area (1953_StHelena_AP.jpg). For Tasks 2 & 3, you will use the data you collected in small groups during lab and secondary data you download yourself. For the secondary data, we recommend the High Resolution Orthophotos available from the AGRC. Either TIFFs or JPGs will work, but JPGs come in a zip file with everything you need, whereas you need to manually get the world file and XML auxillary files with the TIFF). You need to figure out what image(s) to download that provide coverage of your survey area (the USU Quad we surveyed). Be sure to report the resolution of the data you choose to download. The primary source of data for Tasks 2 & 3, is the data you collect in the field. We will make this data available to you by the end of this week. This data consists of 1) aerial photos you collected with the blimp, and 2) coordinate data for the control points you collected with the total station. Here, we tell you where you can retrieve that data. In later sections of these instructions, you will be provided with information to help you decide what subset of the available data you need to download. You are welcome to download it all but you certainly do not need it all! You should only download a subset of the data that your group acquired. See BlimpSlides_2009.pdf for some examples of georeferenced images from earlier Blimp flights. Tuesday was a decent day, but camera issues limited the number of images that were captured. Zip files include photos and CSV file containing target coordinates. There are 19 photos from the first Tuesday flight. The second flight captured 73 photos (Flight B). Each zip file contains a CSV file with the surveyed target coordinates. It took 9 people to bring the blimp down after a harrowing 20 minute flight (fight) by Logan E and others. The Blimp tried so hard to fly off to Idaho it nearly broke the wooden handle, pulling the nails out of the tether reel. Again, each Zip file includes photos and a CSV file containing target coordinates. Flight B recruited some random passers-by to send a special message (see images 5000 to 5006). While the whole quad wasn't captured, there are some great images here. Flight D got some great images of the whole quad (Brian R got the blimp up to 250 m!). There are approximately 180 photos from the first Tuesday flight. They have been zipped into 2 folders (Set 1 and Set 2) in an effort to make downloading a bit easier. The first folder (Set 1) also contains the CSV file with the surveyed coordinates for each pad. You will want to browse the images and choose one that shows enough pads and overall detail. The remaining Tuesday and Friday flights were scrubbed due to camera malfunction. The aerial photos collected with the blimp on Tuesday are not included as winds prevented us from getting enough altitude to capture the entire quad in one image. 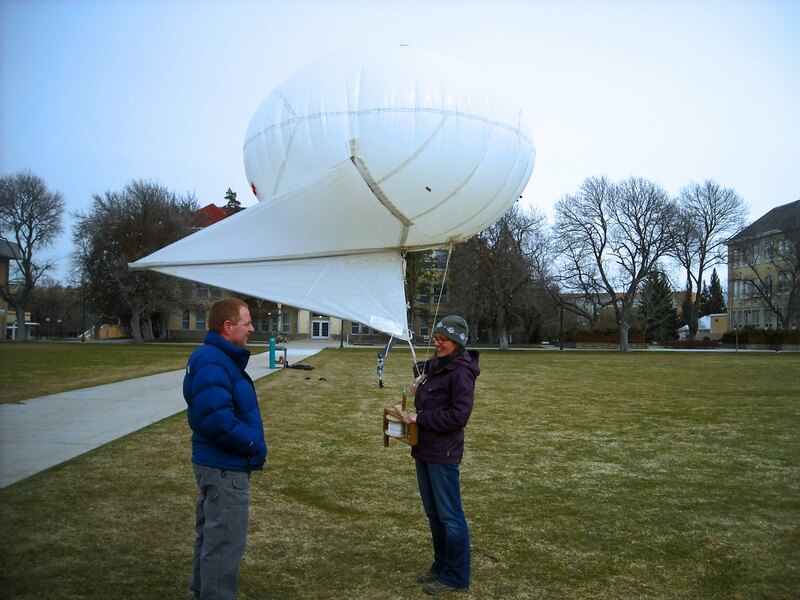 It's important to note that changing conditions can greatly affect the ability to collect data with the Blimp. Flights in 2011 were not under ideal circumstances. Tuesday's lab had decent conditions but the camera settings were off and the images are largely over-exposed and they did not fly high enough to cover the entire quad in one image. Thursday's flight was better, but the winds were strong. The high altitude images don't provide a complete coverage of the Quad (in one image) and a strong northwest shifted the coverage outside the quad. The winds were so strong on Friday that the first group could not fly. TuesdayMarch152011.csv XY coordinate spreadsheet for Tuesday's (3/15) data collection. ThursdayMarch172011.csv XY coordinate spreadsheet for Thursday's (3/17) data collection. FridaydayMarch182011.csv XY coordinate spreadsheet for Thursday's (3/18) data collection. You need to georeference a scanned historical image (1953_StHelena_AP.jpg) based on establishing control points in a more recent (2002_SulphurCreek_AP.tif) correctly georeferenced image. This means that the new georeferenced image you produce will take on the coordinate system and projection of the more recent image. You should also assess how good a job you did at georeferencing the imagery, and create a map that convinces your boss that you did the georeferencing correctly. and any other information that helps convince your audience the georeferencing was done correctly. Download the correctly georeferenced 2006 HRO (high resolution orthophotograph) of the quad (instructions above). Load this image into a new empty ArcMap map document. Ensure the data frame assumes the 'correct' coordinate system from this image. Browse the 100 to 400 images in Picassa that your group acquired during its flight and choose the single best image that provides complete coverage of the quad. This sounds difficult, but you will be surprised how quickly you can browse through all these and choose one that is in focus, is not oblique, and oriented best to suit your needs. If, your group did not fly high enough to have complete coverage of the quad, choose the photo that is the closest to providing complete coverage. For extra credit, you can also browse the other albums and borrow the best image with complete coverage of the quad you can find. To receive extra credit, you will need to produce landscape 11” x 17” PDF with two side-by-side data frames: one showing the georeferenced image from your group and a second showing the georeferenced image you borrowed. Georeference your image to the UTM coordinate system defined in the 2006 HRO, using points visible in both images as control points. Recall skills learned in Task 1 to complete this part of the lab. Especially, make note of your total RMS and remember to ‘rectify’ your georeferenced images and add it to your map document (remove the unrectified image). Start a new empty map document. This map's data frame should not have a coordinate system associated with it. Use an ungeoreferenced blimp image (you can use the same one you used in task 2, or select a new one). Add it to your map document. Add the CSV file to your Arc project and open it to view the contents or open it independently (in Excel, for example). Georectify the blimp image using your control points and coordinates from the CSV (left click on the pad center, then right-click > add x-y data). and any other information that helps convince your audience the georeferencing and transformation were done correctly. Prepare a webpage for this lab on your personal website for the course, which presents the results of Tasks 1 through 4 with attention paid in both your figures and write-up to convincing your boss you understand the process of georeferencing and that you did the tasks correctly. Decide what is the most effective way to layout your results with a combination of images for your figures and enough contextual text to explain what was asked of you (i.e. introduction and purpose), how you addressed it (i.e. methods), what you produced (i.e. results) and your analysis/interpretation of how well this worked (i.e. discussion). Grossinger R, Striplen C, Brewster E and McKee L. 2003. Ecological, Geomorphic, and Land Use History of Sulphur Creek Watershed: A component of the watershed management plan for the Sulphur Creek watershed, Napa County, California. A Technical Report of the Regional Watershed Program, San Francisco Estuary Institute, Oakland, CA, 51 pp.